It has been observed that most of the students are weak in studies or do not have any interest in reading. Such students should not be disappointed now. Read this Qur’anic Verse 21 times and pray to get success in exams.Before and after this wazifa read dorood shareef 3 times. Insallah All the prescriptions will be all right and it will be well with the good marks in the examination. This wazifa is pretty much nothing and takes 2-3 minutes and is extraordinary. Continue until your result turns out. Imtehan mein kamyabi k liye Students boht se wazaif aur duaen karte hain aur Naqsh bhi pehnte hain lakin imtehan main ache marks phir bhi hasil nahi kar patay jis waja se wo Allah ki rahmat se na umeed ho jate hain. Aisay Students agar chahte hain k unhen imtehan main shandar kamyabi milay to ye Wazifa karne wale students imtehan main kamyabi k sath sath har jaez maqsad main kamyabi bhi bohat jald milna shuru ho jati hai. Har namaz k baad ism e azam Subhanallah ya Qaharu 504 martaba awal akhir 11 baar darood pak k sath wird karain. Inshallah Imtehan main zabardast kamyabi hasil hogi. 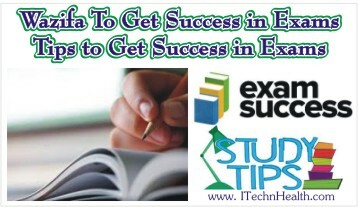 Here I also share some tips for your help to get success in examination. Proper use the last two months before the examination to focus on revision. Revise the all syllabus twice. Read the questions completely. If you any confusion to solve a answer then it’s better to skip it. It will help you to prevent from negative marking. Manage a study plan focusing on important topics. Speed is very important in finishing competitive exams. Do a lot of practice numerical questions and boost your speed in solving such problems. Do different type questions and try to clear basic concepts. Try to find your weak topics and try to solve these issues. Practice last year’s question papers by which you can observe which types of questions come in exam.